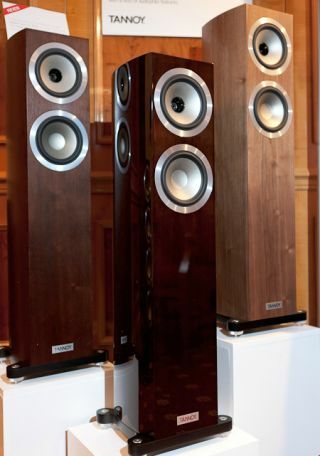 BRISTOL SHOW 2012: Tannoy previews Precision 6 floorstanders – video report | What Hi-Fi? Tannoy is demonstrating preview models from its new Precision range of speakers here at the Bristol Sound and Vision Show. First up in the new range - due in July - are the Tannoy Precision 6.2 (£1800; pictured above) and the Precision 6.4 (£2200). A matching centre speaker and subwoofer will follow, with the possibility of standmount additions to the range at a later date. The Precision floorstanders also feature mass-loadable cabinets, a new plinth design, magnetic grilles and flexible wiring options (see below). They will be available in a range of high-grade finishes - Tannoy has confirmed dark walnut, espresso and gloss black, but may also add a wenge finish (shown at the far right in the picture at the top of the story).